Oct. 31, 2017 3:00 p.m. He was a CFL football player, a pro wrestling main eventer and a world bellyflop champion. And Butts Giraud can still put on a show. The 71-year-old Nanaimo man has discovered new passions in his senior years: music and playing harmonica. Giraud has become a fixture on the mid-Island blues scene, and in 2016, he released his first album, Silver Magic. Giraud didn’t seriously pick up the harmonica until about six years ago. He liked music as much as the next guy, but it was always just something that was in the background over the years as he lived a life that would be hard to believe if it weren’t all true. Giraud played U.S. college football and then in the Canadian Football League with his hometown B.C. Lions and also the Winnipeg Blue Bombers. He wrestled professionally around the world, once dining with Saddam Hussein before a match against an Iraqi champion. Giraud was a four-time world bellyflop champion known for lighting himself on fire before his leaps. He founded the Dog’s Ear T-Shirts and Embroidery Co., which was instrumental in the Vancouver Canucks’ 1982 ‘towel power’ marketing phenomenon. “One thing I know about myself, if I’m going to do something, I want to do it properly, I want to do it well, I want to do it to the best that I can do it,” Giraud said. 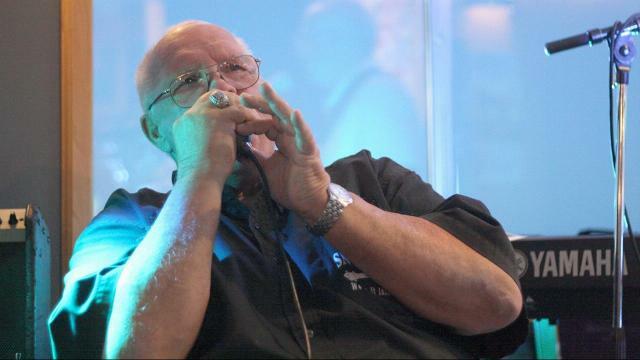 So after being given a harmonica so he could join in at a jam while vacationing in Hawaii, Giraud decided the instrument wasn’t just a holiday fling. He began lessons right away and signed up for blues camp in Mississippi. It took a while for him to gain respect on the music scene, but he’s made a lot of friends and said he knows now that Vancouver Island has got great musicians who are good people. He’s joined Andre Kaufmann’s The Real Deal Band and plays regularly with other musicians, too. Giraud suggested in his 2016 autobiography, The Last Chapter, that he’s done re-inventing himself. That may be true, but the harmonica man has a lot of music he still wants to play. For information about Giraud’s book or album, e-mail dogsear@shaw.ca. WHAT’S ON … Upcoming performances by harmonica player Butts Giraud and his bandmates: Saturday, Nov. 4, French Creek Marine Pub, Parksville. Nov. 5, Bridgemans Bistro, Mill Bay. Nov. 18, Cumberland Hotel. Nov. 25, Shady Rest, Qualicum Beach. Dec. 3, Bridgemans Bistro, Mill Bay.